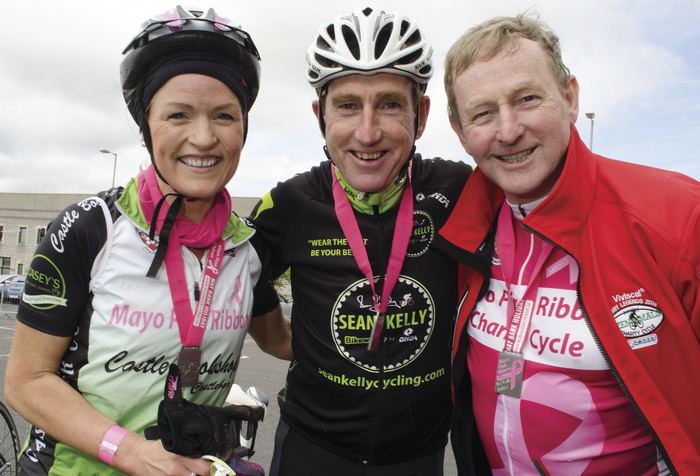 Getting ready for this year's Mayo Pink Ribbon Charity Cycle for Breast Cancer Research were: Ann Heaney, Sean Kelly and Mayo Pink Ribbon patron, An Taoiseach, Enda Kenny. Photo: Alison Laredo. The event, dubbed Ireland’s friendliest cycle, has become well established in the Irish cycling calendar. This year cyclists from 14 counties have already registered to take part, and with distances of 51km, 108km, and 147km to choose from there is something to suit everyone. Speaking at this year’s launch, event organiser Lourda McHugh said: “Every town, village, and neighbourhood has been touched by breast cancer and this cycle gives those communities an opportunity to do something tangible about it. Research is the key and we are passionate about the need to support breast cancer research. All money raised goes to Breast Cancer Research which supports the breast cancer research programme based at the Lambe Institute for Translational Research, NUI Galway, led by Professor, Michael Kerin." The Mayo Pink Ribbon Charity Cycle is not a race, so there is no pressure on participants, just the pleasure of taking part and the sheer joy of finishing. There is no entry fee but as the cycle is a fundraising event for Breast Cancer Research all entrants are asked to raise a minimum of €100 for this very worthy cause. To register or for more details see www.mayopinkribbon.ie or telephone Lourda McHugh on (086 ) 8562423. Are you up to the Nephin challenge? Do you want to put a smile on a sick child’s face?